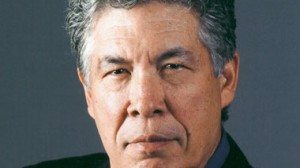 The Sunburst Award Society has named authors Thomas King and Caitlin Sweet the winners of its fourth annual Copper Cylinder Award. King, a First Nations activist, novelist, and University of Guelph professor, was presented the award for The Back of the Turtle (HarperCollins Canada), his 2014 Governor General’s Literary Award–winning novel about a scientist who returns to the reserve where his mother grew up to help with an environmental crisis caused by his company. Sweet, a Toronto–based fantasy writer, was honoured for The Door in the Mountain (ChiZine Publications), her young adult novel that follows a young princess and her family in the mythical world of ancient Crete. The Copper Cylinder Award is voted on by Sunburst Society members. Winners will receive a handcrafted copper cylinder trophy, named for the first Canadian science-fiction romance novel, James De Mille’s A Strange Manuscript Found in a Copper Cylinder.